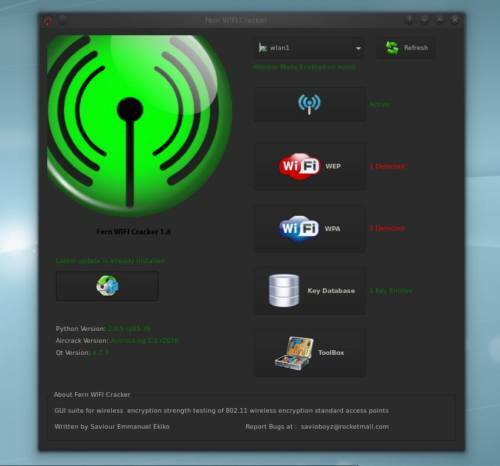 Fern WiFi Cracker is a hacking tool designed for Apple, Windows and Linux users. It was designed to be used as a testing software for network penetration and vulnerability. Nowadays it is used as a network hacking tool. Fern WiFi Cracker is used to discover vulnerabilities on a wireless network. It can detect major issues and flaws of a wireless network. Fern can be paired with Kali Linux and other tools to get advantage of network flaws. However, Fern WiFi Crackeris pre installed in Kali Linux. You can also download it from an external mirror given here. Install Kali Linux on your PC. You will need a compatible WiFi adapter to run Fern. This tool can also run on below operating system other than Kali. Other than Operating system, you will also need some tools to run alongside with Fern. Click here to get a detailed guide to hack WiFi passwords using fern.